A question that has been asked many times "how do I get other poets to give me feedback?" 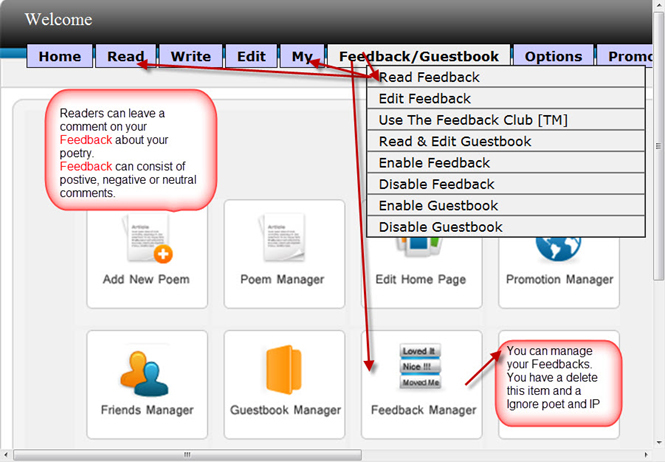 • The Feedback Club is designed for poets that want to give and get feedback. At the Club, you'll get as much feedback as you give. You can get to the Club from your poetry control panel. • Give fellow poets feedback and invite them to your site. Go to your fellow poets' sites and read their poems, give them feedback, and invite them to your site. Just remember treat your fellow poets like you want to be treated! • Go to the "Last 100 Poems"or "Meet The Poets" section to see who is active on PoetryPoem.com. You can get to it on PoetryPoem.com's homepage by clicking on the "Poems" or "Poets" button. You can get to the Last 100 Poems from the red bar on your homepage by clicking on the "Last 100 Poems" link. This allows you to see the active poetry members. • Go to the message board and leave a message. Let your fellow poets know you are interested in receiving feedback. The Message Center can be found at the bottom of PoetryPoem.com's homepage. At the bottom of the page is a gold box that says "Message Center". You can also get there on your control panel. The button is located at the top of the page, it says Message Center. Remember the "Last 100 Poems"